This is a boulder that's basically the backside of the highest point of Outlook Rocks. I'm not sure if it has a name or named routes but clearly bouldering has been going on here. If anyone would like to pass on info then that would be great. There are maybe two main ways up this boulder on the left side and the right. The right side route has a sit start variation that makes it a good bit harder. The crux on either side is down low and then if get's juggy towards the top. On the back side of the highest point of Outlook Rocks. This is at the far west side of the main Carderock area right near the river where the big bend around the west end of Vaso Island is. You can see the C&O Canal trail from here as well. 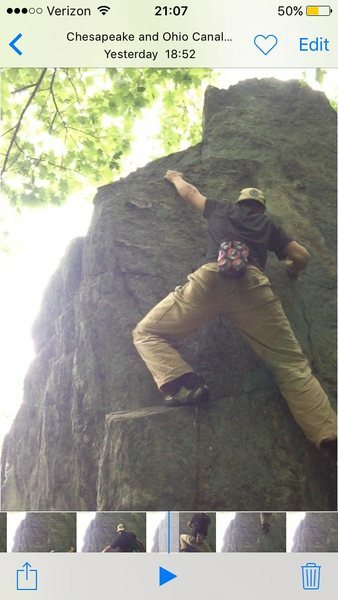 I completed the route on a sit to start following the chalked up holds with no pad. Rate V1+ at most V2. I found this Boulder after the two weeks of rain... Chalk was still present from previous climbs with rain coming down.